Description Of Item: Comes with 8 Booster Packs, 2 Collectible Boxes, Exclusive Life Counter, Player's Guide, and a 40 cards land pack. 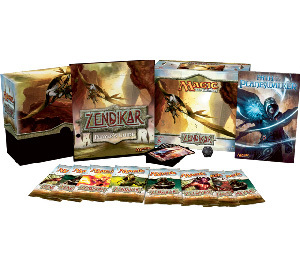 Zendikar is quite frankly the hottest set that Wizards has put out since the early days of Magic. Zendikar is a world of adventure and reward for those with the courage to brave its perils. Learn the value of allies, complete quests, set traps (and avoid them), and take advantage of landfall and kicker as you confront Zendikar's hostile environment.